Direct air flow to the left or right, up or down. Turn the knobs to open or close the vents. 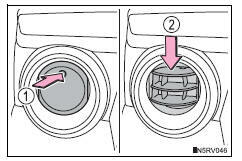 Turn the knob to open or close the vent for rear seat occupants. Fan speed is adjusted automatically according to the temperature setting and the ambient conditions. The windows will easily fog up when the humidity in the vehicle is high. will dehumidify the air from the outlets and defog the windshield effectively. off, the windows may fog up more easily. The windows may fog up if the recirculated air mode is used. Outside/recirculated air mode may automatically switch depending on the temperature setting or the inside temperature. In order to reduce the air conditioning power consumption, the air conditioning system may switch to recirculated air mode automatically. This may also reduce fuel consumption. It is possible to switch to outside air mode at any time by pressing . Outside air mode does not switch to recirculated air mode. The operation cancels after approximately 1 minute. In rainy weather, the windows may fog up. Press . In extremely humid weather, the windows may fog up. The pollens are filtered out even if the micro dust and pollen filter is turned off. The dehumidification function may not operate even when is pressed. 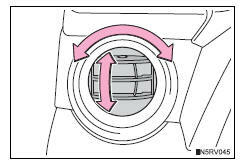 To let fresh air in, set the air conditioning system to the outside air mode. During use, various odors from inside and outside the vehicle may enter into and accumulate in the air conditioning system. This may then cause odor to be emitted from the vents. 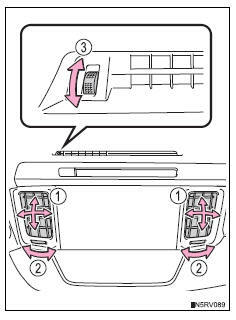 It is recommended that the air conditioning system be set to outside air mode prior to turning the vehicle off. The start timing of the blower may be delayed for a short period of time immediately after the air conditioning system is started in automatic mode. Settings (e.G. Outside/recirculated air mode) can be changed. Do not use during cool air operation in extremely humid weather. The difference between the temperature of the outside air and that of the windshield can cause the outer surface of the windshield to fog up, blocking your vision. Do not leave the air conditioning system on longer than necessary when the engine is off.